Not to be confused with Tanana Athabaskans. For the Athabascan language, see Denaʼina language. 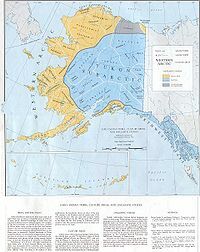 The Denaʼina (/dɪˈnaɪnə/ ; own name: in the Inland dialect [dənʌʔɪnʌ], in the Upper Inlet dialect [dənʌ͡ɪnʌ]) or formerly Tanaina are an Alaska Native Athabaskan people of the Athabaskan-speaking ethnolinguistic group. They are the original inhabitants of the south central Alaska region ranging from Seldovia in the south to Chickaloon in the northeast, Talkeetna in the north, Lime Village in the Northwest and Pedro Bay in the Southwest. The Denaʼina homeland (Denaʼina Ełnena) is more than 41,000 square miles in area. They arrived in the Southcentral Alaska sometime between 1,000 and 1,500 years ago. They were the only Alaskan Athabaskan group to live on the coast. Denaʼina culture is a hunter-gatherer culture and have a matrilineal system. The Iditarod Trail's antecedents were the native trails of the Denaʼina and Deg Hitʼan Athabaskan Indians and the Inupiaq Eskimos. Their neighbors are other Athabaskan-speaking and Yupik Eskimo peoples: Deg Hitʼan (northwest), Upper Kuskokwim (central north), Koyukon (northeast), Lower Tanana (a little part of northeast), Ahtna (east), Chugach Sugpiaq (south-southeast), Koniag Alutiiq (south), and Yupʼik (west and southwest). The name means "the people", and is related to the autonym for the Southern Athabaskan Navajo people "Diné." The Denaʼina name for Cook Inlet is Tikahtnu meaning "Big Water River" or Nuti meaning "Saltwater." The Denaʼina are the only Northern Athabascan group to live on saltwater and this allowed them to have the most sedentary lifestyle of all Northern Athabascans. Their traditional language, Denaʼina, currently has about 70-75 fluent speakers out of a total population of about 1,400. Denaʼina is one of eleven Alaska Athabascan languages. There are four primary dialects of Denaʼina: Inland, Iliamna, Upper Inlet, and Outer Inlet. The city of Anchorage chose to honor the Denaʼina by naming the city's new convention center the Denaʼina Civic and Convention Center. ^ Patricia H. Partnow 2013. Denaʼinaqʼ Huchʼulyeshi: The Denaʼina Way of Living Archived 2014-03-20 at the Wayback Machine. Anchorage Museum. ^ The Iditarod National Historic Trail Seward to Nome Route: A Comprehensive Management Plan, March 1986. Prepared by Bureau of Land Management, Anchorage District Office, Anchorage, Alaska. This page was last edited on 27 February 2019, at 06:28 (UTC).